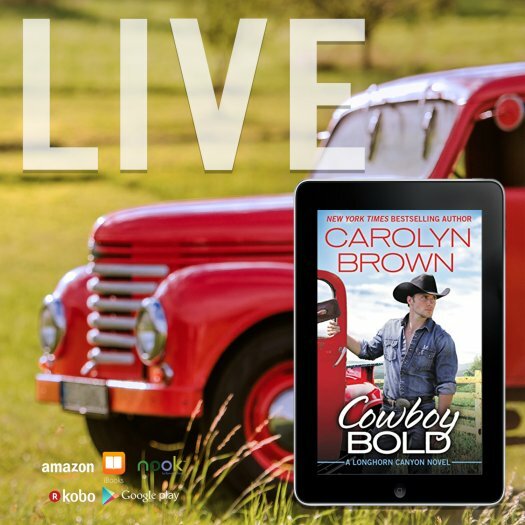 Carolyn Brown has stopped on over to share an excerpt with you of her book Cowboy Bold! Cade passed out straw hats to everyone as they filed out to get on the hay wagon, and Retta was more than glad to settle her new straw hat on her head. It didn’t feel as good as the one she’d left behind at the farm but with sweat and time it would shape up and fit right well. “I like my hat. It’s like Cade’s. ” Benjy plopped the one with his name on the inside down on his head. “I need to draw the wagon. Some hay wagons have wood wheels.” Benjy walked away and chose a seat at the back of the wagon. “Once you turn thirteen, you don’t get to come back,” Retta explained in a low voice. “I’m only ten so that means I might get to do this again.” She beamed as she skipped down the porch steps. The tires on the old wooden wagon made the ride a little less bumpy. But the wagon itself was the same as she’d been in dozens of times as a kid. Open air, benches on two sides, and hay strewn on the floor. She spotted a cooler at the back and figured that it was full of either water bottles or cold drinks. She sat down beside Alice, and Sasha quickly sat on the other side of her, which meant again that Gabby and Faith had no choice but to sit together. Maybe Cade was right about making them learn teamwork. Retta listened with one ear but if she leaned far enough to one side, she could see Cade’s face reflected in the side mirror on the tractor pulling the wagon. “Those are some whompin’ big hunks of hay to be picking up,” Faith said. “I could get them bales to the barn,” Nelson said. “Yeah, right?” Kirk smarted off. “I can and if I do, then I make money to take home, right, Skip?” Nelson asked. Retta could see dollar signs dancing in all of their little eyes as they thought about helping haul that hay to the barn the next day. When she looked at the mirror again, she caught Cade’s eye and he winked at her, causing a blush so deep that she removed her hat and fanned with it. Carolyn Brown is a New York Times and USA Today bestselling author, as well as a RITA finalist. She has written several beloved and popular romance titles, ranging from historical to contemporary to cowboy-themed. She and her husband live in Davis, Oklahoma. They have three grown children, and enough grandchildren to keep them young.